These baby's are going RED, WHITE & BLUE! The 4th of July has come and gone and that means that I have plenty of Red, white and Blue crafty stuff just lying around. The possibility's are endless. I went through all of my craft things and no paint...hummm, what to do? Remember the challenge is not to run to the store every time I run into a snag or have a new and better Idea. So I'm off to the kitchen, there has to be something I can use there! 20 min's of bleaching and this is where we are! I did spend an extra 10-15 min's scrubbing the Die out of the shoe. I wanted to make sure that I was going to get an even bleaching and not have any of the previous color (black) left behind. I dried them and re-bleached for about 5 min's to remove some rust stains, washed and dried again. This is the finished product of the bleaching! I 'm surprised it came out so good. I thought I would have to do more of the bleach application to get this result with a previously black shoe! 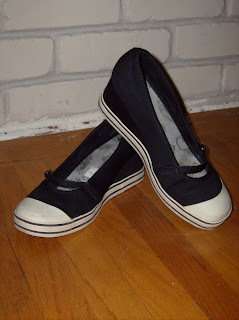 Here we have a plain boring pair of wedge sneaker that have seen better days. 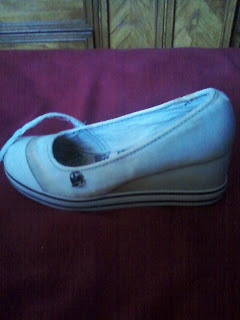 I bought them at the salvation army a few days ago for two dollars. The plan is to transform them in to something fabulous. I love a challenge, so I am doing this project with only things that I already have around the house. I'm Bringing life back to my old Soles. Sneak a peak at what I am working on this week.